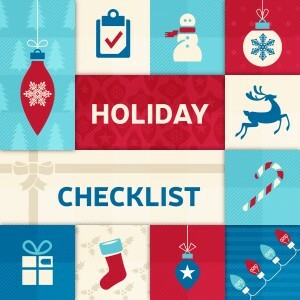 A pre-holiday ADA checklist that makes you money! | ADA Compliance Consultants, Inc.
“Black Friday” marks the beginning of the official “Holiday Shopping” season and the transition into time off with family. Whether it’s hitting the stores for great deals or hitting the road to Mom’s house for the holidays, millions of retailer’s will benefit. Retailers inherently know this, and they prepare by staging large amounts of product outside their main entry doors to catch our attention as we enter. They typically use every square inch of the sidewalk, parking stalls and loading zone areas in front of their stores with “specials” we can’t seem to resist. Unfortunately, in some cases, they stack everything from pumpkins and Christmas trees to boxes of scented pine cones and anything else they can think of directly in the disabled parking stall area, loading zones and at the top and bottom of the curb ramps. This is a big deal for many disabled customers in that they rely on this space to be clear so they can park, exit their vehicle and access the store’s entry. Many disabled customers will park, exit their vehicle and shop at multiple stores throughout a particular center. If the sidewalk in front of the stores is blocked by merchandise reducing the accessible route’s clear width, it can make it very difficult and sometimes impossible for some disabled to get through. At the very least, this can really make it difficult for shoppers using wheelchairs, walkers or parents with strollers to move freely about the center and spend their money. Even worse, it is an open invitation for those disabled activists and their attorneys who are out looking for such violations to zero in on you. If you are a business owner, property manager or landlord of the property, you should take note of this. Here are some things to keep in mind this season to maintain accessibility to your place of business. Double check your disabled stall and loading zone striping to ensure proper width, depth and color arrangement and check your parking stall signage to confirm the current requirements for your area. Check your curb ramps for non-compliant truncated domes or broken and lifting dome panels. Keep the path of travel up the ramp with top and bottom landing 48” minimum clear space free from any product. Make sure your main entry doors are clear and uncluttered from displayed products. Maintain a minimum 36” clear path of travel throughout the interior of your store or business to allow all disabled to access goods and services. Shop owners should check their areas twice a day or more so that product isn’t moved or left sitting in these areas by customers. What starts clear and compliant in the morning can soon become a disorganized mess by the afternoon. Clear your sales counter of advertisements, product and clutter. Ensure that the point of sale machine is no higher than 48” above the floor and the accessible sales counter is set no higher than 34” above the floor. Check your restrooms and make sure you have the door and wall signs, lever type door hardware, 60” clear turning radius inside, mirror, paper towel dispenser, soap dispenser set no higher than 40” above floor surface. Double check your own internal policies’ and procedures’ when it comes to providing a higher level of service for any disabled customer. Review with your employees and ensure everyone is on the same page. The needs of a wheelchair user compared to a deaf/ hard of hearing to a blind or low vision differs dramatically and knowing how to communicate with each individual is very important. Property managers need to watch out for tenants that continue to block access so that it can be corrected quickly before problems arise. Be diligent during the colder and wetter months as this is when our customers are in full holiday shopping mode. Let’s make this the best holiday season yet for those visiting our properties by keeping it safe and accessible to everyone. If you have any questions regarding the level of access on your property or in your building, please don’t hesitate to contact me directly.